Those of us who carry a handgun everyday put a lot of thought into which gun is right for us. We consider caliber,size and other criteria. 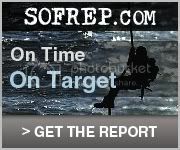 The problem is many times we neglect other essential equipment that we should give as much thought too as our handguns. Two of these items are the knife we should carry as well as a flashlight. I’ve carried many different knives in my law enforcement career. Of course some proved better than others. The knife I carry now is the best knife of the bunch. It’s the Blackhawk MOD series CQD Mark1. This very sturdy knife has all the features any officer or civilian could ever want or need. 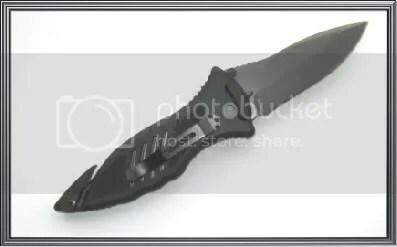 The body of the knife is made from injection molded nylon with 420J stainless steel liners. With that construction I don’t see how you could possibly damage it to the point of failure. The surface of the grips are stippled for a firm grip when your hands are damp or when the user is wearing gloves. The body also has an extended pommel for striking. Just in front of the pommel are two very sharp blades recessed into the body. These blades cross each other for cutting seatbelts, Para Chord or any other utility cutting. These are razor sharp and will cut anything that fits in the wedge the blades are mounted in. These blades are approximately one inch in length giving them a great deal of strength. 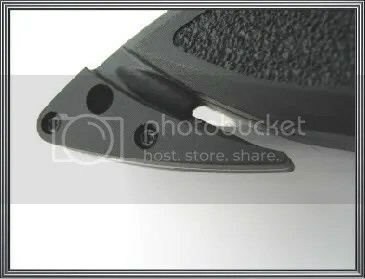 The body of the knife has a pocket clip which can be reversed to the opposite side of the knife. The blade is large at 3.75 inches in length and constructed from AUS8A stainless steel. The blade is coated in PVD to protect it from rusting as well as making it more difficult to see at night. 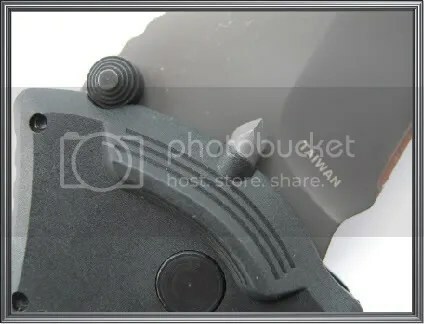 The blade also has thumb studs on both sides. When the blade is deployed it automatically locks into place. 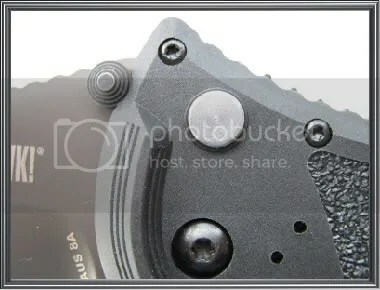 To release the blade a silver plunge lock button is depressed allowing the blade to be folded. A secondary lock is mounted as a sliding piece on top of the body which is easily operated with your thumb as it rest on the flared knife body. Another great feature is a glass breaker mounted alongside the blade hilt. It’s made of steel with a rather sharp point seen below. At least for me this is the best knife around to compliment my other equipment. With a retail of $100 you get a lot of knife for the money. I would encourage anyone in the market for a great knife to check this one out!